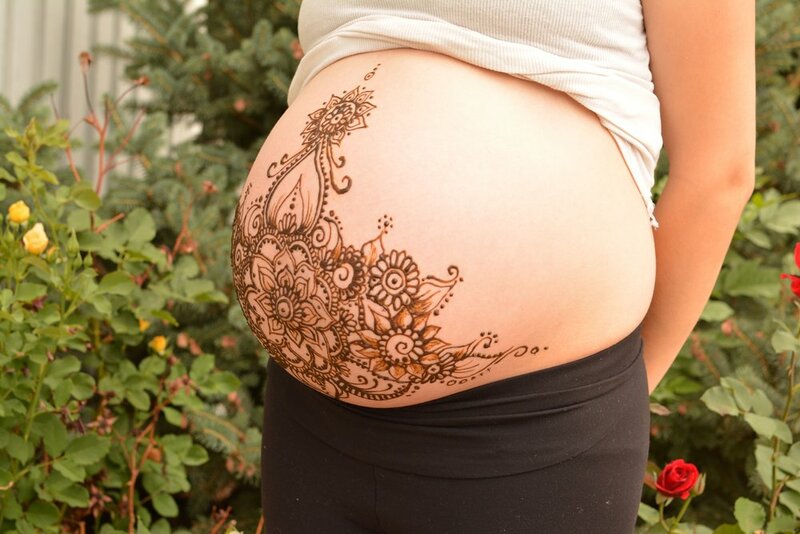 Bless your baby and belly with beautiful henna! Henna is a safe, beautiful and medicinal natural dye made from the Lawsonia Inermis plant. The red-tinted dye of this small bush has been used in ceremony and transition for over 9,000 years to symbolize beauty, strength, and connection. Countries such as Morocco and India traditionally apply henna during the third trimester of pregnancy, as it is believed to protect and bless the mother and child, ensuring a safe, healthy and peaceful delivery. Henna on Sierra by Sierra. Your pregnancy is your sacred rite of passage and your baby's entrance into this world. Honor this time of reverence and the blessing new life with a special henna design by Sierra of Vibrant Souls! Being adorned with henna is a fun and meaningful experience that will leave you feeling beautiful and empowered! Each design is completely unique to mama and baby. Henna is the perfect gift for a shower, blessing way or among friends. I make it easy for mama, as I will come to her home or party with all henna supplies plus a special relaxing tea offering. Please inquire about group henna parties, henna photography or birth photography. Services are provided in and around Boulder, Colorado. Interested in having your placenta encapsulated for a vibrant postpartum recovery? Check out my loving, professional placenta encapsulation services!